Hidetools Spy Monitor is powerful spy software that secretly records your children's or employees' computer activity: typed keystrokes, visited websites, screenshots, opened windows, applications run, passwords and more. Our Spy Monitor can automatically create log reports and send them to your email address. This allows you to monitor any PC from any place where you can check your email. Spy Monitor is completely hidden from other users. ...... The program can automatically create the log reports and send them to your email address. This allows you to monitor other users from any place where you could check your email. Hidetools Spy Monitor is COMPLETELY hidden from others. Only you will know that spy monitor is installed! Perfect for employee monitoring, spouse monitoring or parental control. Spy Monitor secretly records every keystrokes typed on your computer along with the application title and time. Also, it allows you to record passwords with ease. Every user can be monitored. Spy Monitor records all website addresses (URLs) along with website titles and date/time of the visit. 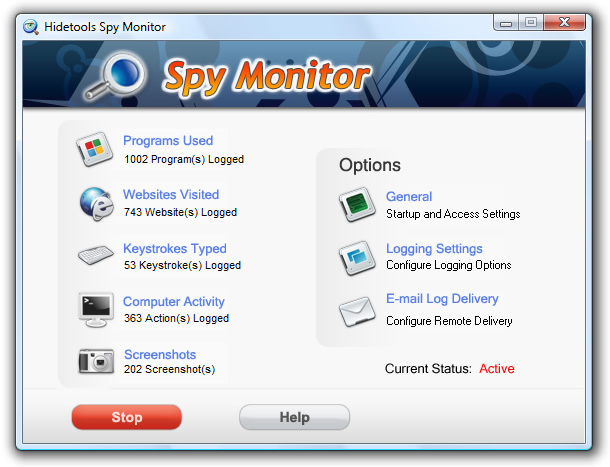 Spy Monitor is compatible with all versions of the following browsers: Internet Explorer, Firefox, Opera, Chrome, and others. Qweas is providing links to Hidetools Spy Monitor 6.5.1 as a courtesy, and makes no representations regarding Hidetools Spy Monitor or any other applications or any information related thereto. Any questions, complaints or claims regarding this application Hidetools Spy Monitor 6.5.1 must be directed to the appropriate software vendor. You may click the publisher link of Hidetools Spy Monitor on the top of this page to get more details about the vendor.